I am hosting today, and I welcome you! Students - Many of us have been new before: to a school, to a neighborhood or family or team or friend group. And while being new is exciting, it can also be a little bit scary. Today's poem is from a brand new book I'm celebrating for Poetry Friday today. The title of the book is YOU JUST WAIT, and it was created by Janet Wong and Sylvia Vardell. I was honored that they chose this poem of mine (from THE POETRY ANTHOLOGY FOR MIDDLE SCHOOL) to be part of the story. YOU JUST WAIT is different from most other books as it threads together poems by many poets to make one complete story. And interspersed between the poems are various writing exercises to try out yourself. This is a neat idea, this taking poems by many people, writing some new ones, and stitching them together to make a new and complete whole. Poems that never knew each other before are now woven together into a book, telling a story. You could try this too - tie connections between others' poems that have never been connected before, and write some of your own new poems to fill in between the cracks. It's like a verse novel marrying an anthology marrying a book of writing ideas! 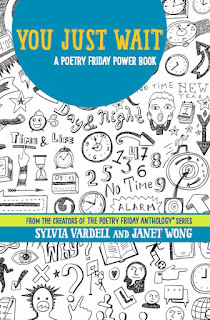 Many of you may know about the Poetry Friday Anthology Series, published by Pomelo Books, and today I am happy to welcome creators and editors Janet Wong and Sylvia Vardell to The Poem Farm. While YOU JUST WAIT - Pomelo's latest book - is for reading...it is also for writing. Janet joins us today to share thoughts about this newest book. And she is also offering five copies to one winner who comments on today's post. Welcome, Janet...take it away! 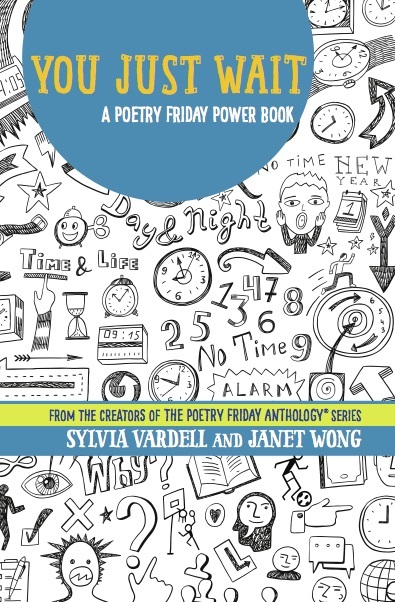 We wanted to try something really different with YOU JUST WAIT: A POETRY FRIDAY POWER BOOK. Last spring I revisited a great post on Lee Bennett Hopkins by Renée M. LaTulippe at her No Water River blog and was reminded by how Lee has always pushed for something new and original with each book. For instance, his HarperCollins I Can Read Books were groundbreaking in the way they used quality literature as instructional text. Lee was also one of the first to combine nonfiction informational text with poetry—now a standard element in poetry books with a social studies or science connection. With YOU JUST WAIT and hopefully with forthcoming books in a Poetry Friday Power Book series, we’re also happy to defy categorization. YOU JUST WAIT is a verse novel made for tweens and teens, yes. But it is also a journal for young writers. And a creativity book that encourages kids to doodle and explore their thoughts on life. And a book on poetry instruction, with mentor texts for teachers. All that, rolled into one. Below, you can take a look at Powerpack10 from the book. Each Powerpack is organized in the same way, with these same five sections. It is a treat to offer not one or two or three or four, but five copies of YOU JUST WAIT to one commenter on this post, enough for a little group to have a lot of fun with this latest addition to the Poetry Friday Anthology Series. Please simply leave a comment on this post by next Thursday, September 15, to be entered into the drawing. I will announce the winner next Poetry Friday, September 16. Thank you to Janet and Sylvia for such generosity. If you win, you'll have five of the first copies...hot off the press. If you would like to read more about YOU JUST WAIT, Sylvia Vardell is celebrating this book birthday over at Poetry for Children! Happy Poetry Friday, Amy! I'm really excited about YOU JUST WAIT. I love the idea, and I love your poem too! oh, my goodness.....I not only want this book. I NEED this book in my middle school library (and for myself too). Wong and Vardell, there's just never a day that I'm not impressed with your creative powers. WOW! Can't wait to get my hands on this book. I finally had to tape "Mrs. Mitchell's personal copy" all over my own Poetry Friday Celebrations book....so it would keep coming back to me from it's many trips around my building (and we have a copy for the Ts to check-out too). Amy, thank you for hosting. My Poetry Friday entry is a riff on a poem of yours from a couple weeks ago. I get so many ideas from Poetry Friday. I could spend my whole week just responding to all the contributions of Poetry Friday. Have a great week and I look forward to seeing lots of new and established poetry this week. What an interesting concept! I look forward to reading the rest of the novel in verse as well as seeing how the book packs and unpacks the poetry! Hi, Amy! Thanks for hosting today. I'm really excited about this book, too– it's so fun and innovative. My 13 year old is going to gobble it right up! (Your poem is terrific, BTW.) But don't bother entering me in the drawing since I already have a copy. I'll be posting about it in the next week or two. :) I'm not sure if you have an automated link up. I didn't see one, but I'll check back to make sure. If you're rounding up the old fashioned way, my PF link is here: https://michellehbarnes.blogspot.com/2016/09/laura-shovan-fractured-fairy-tale.html Laura Shovan is guest blogging today, with a post about a fractured fairy tale workshop she developed for the classroom. Neat, huh? Thanks for hosting, Amy! GREAT intro to this new and fabulous book. (I'm thrilled to have a poem included, too.) I think the concept is just fantastic, and kids are going to love the many ways to enjoy and explore it! Your poem is perfect for the start of school. I'll offer another wee peek in a couple of weeks. I love all the unexpected links on Poetry Friday. I came from posting about a door ... to reading a poem with an invisible door. Lovely lilt to your poem, Amy - and fascinating reading about this new poetry resource. I hope it inspires and enables oodles of kiddles. What an exciting announcement! Janet & Sylvia are the warrior goddesses of poetry, always advancing the cause! Thanks for hosting! Wonderful to read your poem, Amy, and to learn more about Janet and Sylvia's new book. Love the concept!! I'm returning to Poetry Friday after a summer blog break by featuring Elisa Kleven's new rhyming picture book, The Horribly Hungry Gingerbread Boy (my link goes live at 6 a.m. Friday). Thanks so much for hosting this week. It's nice to be back! YOU JUST WAIT sounds like a fascinating creation from Janet, Sylvia, and the poets. I hadn't heard about it either! This week, I'm reading a new MG novel, HOWARD WALLACE, P.I. Howard thinks he is a middle school Sam Spade, but he's more funny-bone and soft-heart than he is hard-boiled detective. I'm pairing the book with Naomi Shihab Nye's poem "Riding." This new book from Janet and Sylvia sounds fabulous! I always wanted special poetry notebooks for my students to savor, and these sound like something I would have loved! Will share with my former colleagues. Thanks, Amy, Janet & Sylvia. I have a new blog post I submitted. Methinks you'll really like it because you're featured in it pursuant to a e-mail exchange we had over the summer about my process in learning my poems by heart. Can't wait to read Sylvia and Janet's new book, and am also honored, as usual, to share pages with you in another book! Amy, what a great framework Janet and Sylvia have developed for their new book, YOU JUST WAIT. Congratulations on having your poem "First Practice" as one of the outside poems in the book. Being new is a tough spot to be in for an adolescent but your poem puts it into perspective as the newness wears off. Now back to Janet and Sylvia's book that seems to be loaded with wonderful ideas, poetry, and extension lessons for adolescents. I am so excited to find out more since this is the first hearing of it. Thank you again for sharing the news and hosting. What a wonderful book to own. The idea of kids really owning it is beautiful. Thank you for sharing this resource and your poetry. I had the distinct pleasure of watching this book come together. Over the summer I presented at a poetry institute where Sylvia and Janet took it for a trial run. It was fascinating to see how the teachers in the room reacted to the concept, the content and the presentation, and even more--would mind-blowing be the right word?--to see how Janet and Sylvia took the feedback, retreated to their workshop, and came back the next day with a whole different vision for their project. And BOOM, here it is! How exciting. Your poem plays an important role in the development of Paz's storyline--congratulations! This new Pomelo book is totally innovative! It sounded fabulous when it was described to me, but now that I've SEEN the parts and how they work together...WOW! I'm so crazy about Poetry Friday--I commented last night. Such a jump in first and read directions later kinda girl. Apologies to Amy. First, Amy, thank you for hosting. Poetry Friday is a hi-light in my week. I go to the links for ideas throughout the week and it feels like a battery re-charge. I love the two poems featured....I need JUST YOU WAIT in my middle school library. I have the perfect group of 1,100 or so kids that will not only love the poems but move a step close to writing with JUST YOU WAIT. Thank you for writing this. I'm always impressed by the Vardell & Wong team of creativity. I'm looking forward to clicking and reading through the links today. Have a great day everyone. Janet and Sylvia are my heroes. They keep that poetry love alive and are so generous with their books. I have a wonderful collection of Poetry Friday books. I can't wait for JUST YOU WAIT ;-) It sounds like such a wonderful tool to encourage kids to write poetry. I love your poem. Really love "that turns outside to inside, stranger to friend." Thanks so much for hosting today. Along with their wonderful anthologies, Sylvia and Janey should sell some of their Magic Energy Elixir - I swear, their energy and enthusiasm is super-natural. Thanks for posting news of You Just Wait, Amy. One note about my Poetry Friday link this week - it's to my post at Books Around the Table, not the usual Drift Record post. I talk a bit about pencils and pencil boxes, but there are two of my poems there, too, and a link to a poem titled "Pencil" by Marianne Boruch. I so love this poem Amy. You, my friend, have a wonderful insight into the hearts and minds of young people. Thank you so much for hosting this week. The Poetry Friday anthologies really do look great. I should look into purchasing them for my research project. I hope they are available in Amazon. Thanks for sharing this. Love your poem, Amy, and the book looks great -- thanks for a packed post full of great stuff! Hi, Amy, thanks for posting, for your shout-out for our new book, and especially for sharing your thoughtful poem for this project. You know how much we love working with you and celebrating your poetry! My post is also about YOU JUST WAIT-- a "launch" post that provides more examples of what people can find in YOU JUST WAIT. Meanwhile, best of luck with all the exciting NEW transitions for you and your family! Amy, I just realized you shared my link...thank you! I didn't see "Mr. Linky" when I left my comment, but just noticed it now - so I left my link, then saw that you had already shared mine. Hope you're having a nice Friday. Love your poem...and the book! It is such a "novel" idea. 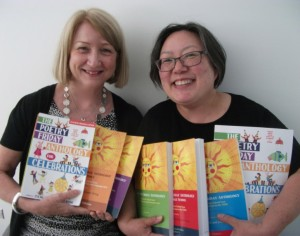 Janet and Sylvia have done great work promoting poetry for children. This sounds amazing! And how cool that I talked about the Poetry Friday Anthology for Middle School in my post today, too! I'm looking forward to You Just Wait, too--what a great idea! On my blog (http://www.joannmacken.com/blog.htm?post=1039764), I've posted about being inspired by Mary Oliver's Owls and Other Fantasies. Great poem, Amy, and thanks for hosting. 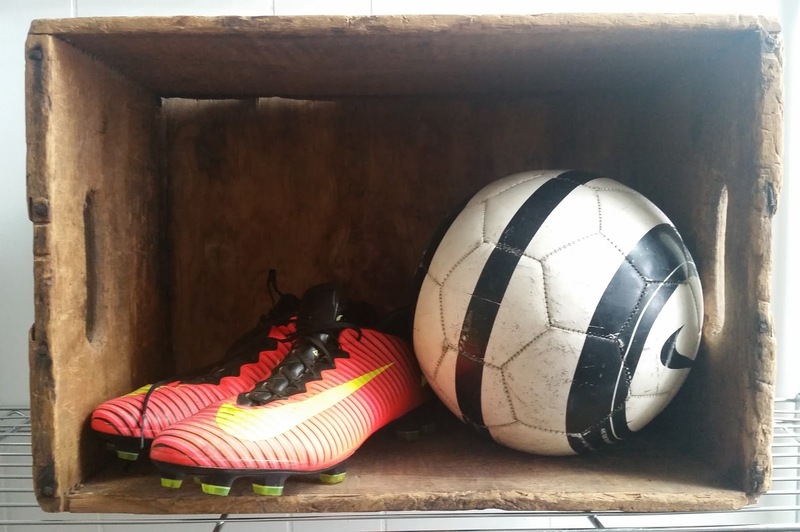 It's good to remember the nerves that go with joining a team. The Just You Wait books sounds ground-breaking and fun. How cool to give away 5 copies. Fun to think bout starting a small group to workbook it. Amy, thank you for hosting us this week. I love your poem. Today is the book birthday for JUST YOU WAIT, and I can't wait. I MUST see this book. How exciting the format seems to be. How perfect for middle schoolers. I gotta get it, and I'm NOT going to wait for the POETRY CAMP (for adults) at WWU in Bellingham at the end of the month to see it. I'm off to order it now. Oh, what fun! Amy, thanks for hosting. This book is news for me and so exciting! I would love to win the set to share with my middle school book club. I'm always working on spreading poetry love with my group, but it's difficult for some of them. I'll be sharing your poem soon. I'm off to read Sylvia's post now! What a fun book and a great way to get middle schoolers to enjoy reading and writing poetry. I see many of 6th graders loving this book. Thanks for sharing! Oooh! What a nifty book. Can't wait to get my hands on it! Really like the poem you shared. It expresses a feeling we can all relate to. Wow, what a beautiful Book Birthday party! Thank you, everyone, for all these wonderful reactions to our new book. Linda Mitchell: I hope that you find yourself needing to write your name on your own copy of this one, too--but when books "walk," it's the ultimate compliment, isn't it?! Keri: next time I run out of [Julie's] "Magic Energy Elixir," I'll remind myself that, once upon a time (on 9/9/16), I was a "co-warrior goddess of poetry" . . .
Heidi: YES, as you described, we made enormous changes to this book as we developed it--all for the better, we hope! Leigh Anne: We think 6th graders will love it, too--but we truly feel the book will work for anywhere from 4th grade to high school. And Myra: YES! Available on Amazon!! Sylvia and Janet have outdone themselves! Just You Wait looks like an incredible resource. And "First Practice" is perfect for sharing with a class with more than its fair share of reluctant writers. Can't wait to get a copy. Thank you for sharing this with us, Amy, and for hosting today! And thank you to Sylvia and Janet for this amazing book!